Guest post by Thomas Kaufman in memory of Kathy Matthews. The original Drosophila Stock Center was housed at Cal Tech in Pasadena and was established by Calvin Bridges and Alfred Sturtevant—students of Thomas Hunt Morgan. On Morgan’s and Bridges’ deaths, the responsibility for the collection fell to Sturtevant, who subsequently passed it to his student Edward Lewis. In the early 1980s, this collection contained ~1600 stocks, representing mostly classic mutations, chromosome aberrations, and balancers that had been accumulated over the years. The center was supported by the National Science Foundation (NSF), and it distributed stocks to the Drosophila community at no cost. How did the Cal Tech collection move to Indiana University? In the early 1980s, the Annual Drosophila Research Conference (ADRC) was a much smaller affair and could be held at more intimate venues. One of the favorites was Asilomar, a conference center on the Monterey peninsula in California. I was standing in line for lunch and chatting with Dan Lindsley when he mentioned that Ed Lewis was retiring—and that Cal Tech didn’t want to continue hosting the stock collection. It occurred to me that my institution, Indiana University, with its excellent fly facilities and low costs, might be a good place to move the collection. I proposed doing so, and Dan agreed to talk to Ed and help with the move. My volunteering was not entirely altruistic. At that time, there was a young postdoc in my lab named Kathy Matthews. Kathy had come from the University of Texas where she had gotten her Ph.D. working in the lab of Yuichiro Hiraizumi on the population dynamics of transposons. She was an accomplished geneticist and adept at genetic manipulations. Her work in my lab focused on the genetics, molecular, and developmental biology of the α-tubulin gene family in D. melanogaster. The contrast between her thesis work with her postdoc project illustrated not only her wide-ranging interests but her technical bravery as well. An example of her technical fearlessness lay in her developing 2D gel technology in the lab. In the early 80s, there were no kits, and one could not simply order a fancy gel apparatus out of a catalogue. Kathy built her own 2D gel boxes and proceeded to produce some of the most beautiful 2D gels and westerns I have ever seen. Additionally, she designed and expressed unique peptides from the conserved α-tubulin proteins, allowing her to raise isoform specific antibodies to study their different patterns of accumulation. I knew that Kathy was not particularly excited about the prospect of a traditional academic position that involved teaching and committee duties. She simply liked doing science without these other distractions. She was smart, knew flies and genetics, and was very well organized. I thought, if she would do it, she would make an excellent manager for the stock collection. Ed Lewis had always had such a person, and it seemed a good idea to continue with his model. When I returned from California, I told her of Cal Tech’s lack of interest in keeping the collection and proposed that we move it to IU—and that she be the collection manager. She agreed, and we began the process of getting the NSF grant transferred to IU by writing a new proposal and making plans to have the flies mailed to Bloomington, thus establishing the Bloomington Drosophila Stock Center (BDSC). The BDSC collection now contains nearly 68,000 stocks, and the center distributed 218,429 samples worldwide in 2017. The staff has now grown to five senior scientists, four research associates, and fifty part- and full-time stock keepers. 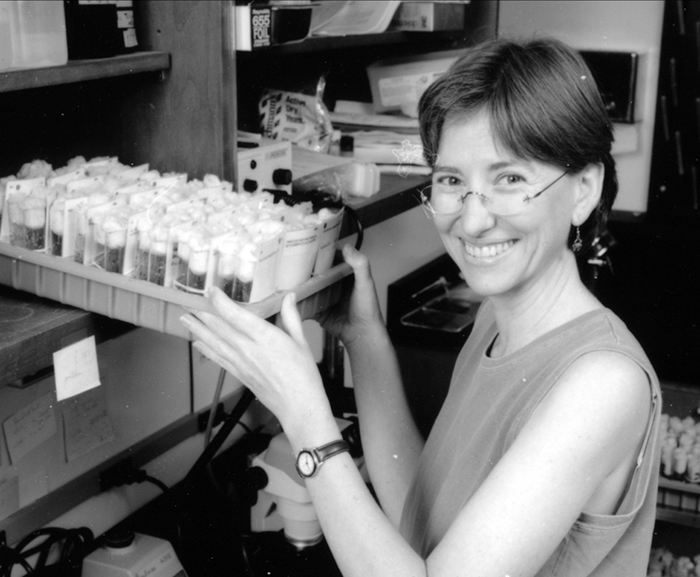 Kathy oversaw all scientific and administrative functions and skillfully guided the center as it was supported first by NSF funding, later by a cooperative agreement between the NSF and NIH involving the introduction of user fees, and currently by NIH subsidy. At the 30th ADRC in New Orleans in April 1989, Dan Lindsley approached Kathy to tell her that the most recent “Red Book” (a compendium of all Drosophila genes, mutations and chromosomal aberrations) was to be his last, and a new way to collect and summarize genetic and genomic information on flies had to be found. He knew the BDSC had its stock lists available at the IU BioArchive, and he wondered if that mechanism could be parlayed to provide Red Book-like material. An informal workshop on Drosophila databases was held at the meeting, with a more in-depth workshop occurring under the auspices of the National Center for Human Genome Research (NCHGR) in 1990 in Bethesda. This meeting concluded with a group of volunteers agreeing to work together on an integrated Drosophila database; Kathy, of course, was one of the volunteers, and work on FlyBase began. Much like the BDSC, FlyBase has grown enormously both in content and scope. It evolved from a simple relational database of stock data with flat files provided via ftp into an interactive web-based database that provides query tools to access the data. With the addition of newer tools and larger data sets, FlyBase has now evolved into the sophisticated research instrument and knowledgebase that we know today. Kathy was a strong guiding force through much of this development. A good deal of these two powerful resources would not have been possible without the active, instrumental, knowledgeable, and selfless involvement of Kathy Matthews. Her contributions to the Drosophila research community have been numerous and exceedingly important. We could not do things the way we do them today without her hard work, dedication, and foresight. She was an enormous gift to our community and she will be missed. We are the better for her all too short presence amongst us, and we are the less for her passing. Such very sad news to hear of Kathy’s passing. Sincere condolences to Lawrence, Thom & Trudy, I couldn’t be more sorry for your loss. Farewell, Dr Kathleen Mathews. Distinguished contributions like your’s is worthy of emulation. And to Thom Kaufmann, may you and entire BDSC team be comforted and wax stronger and mentor many more resourceful scientists.